If you’re unexpectedly pregnant and looking at your options, you may be considering adoption. But how much do you really know about it? For most women with an unplanned pregnancy, adoption means “giving up” your baby and never seeing him again. “I could never do that,” they’ll say. The good news is, you don’t have to. Adoption has changed. Today, in open adoption, women don’t “give up” their baby. They make a plan — one that is tailored to their individual needs and created out of love for their child. As an expectant mother, you can be as involved as you want to be in putting your plan together. That includes everything from selecting parents for your baby to naming him to creating a hospital plan. And you can also be a part of your child’s life after placement. But like any life-changing decision, adoption is complicated and can be overwhelming, especially in the early stages if you’re new to it. There are lots of things you need to get your head around: laws, regulations, requirements. Plus, lots of emotional stuff to balance. No doubt you’ll have lots of questions for others as you move forward with your plan. Here are three to ask yourself first. Is adoption the right decision for me? Adoption can be a wonderful alternative, but it’s not for everyone. Every adoption is predicated on loss, and each individual comes to it from a different set of circumstances, for different reasons. Generally speaking, most expectant mothers consider adoption because they’re not ready or able to parent. They want their child to have a wonderful future, but they’re not at a stage in their life where they believe that they can provide them with one. And so they look for another family that can. Finding parents to raise your child isn’t a decision that anyone takes lightly, and as you consider it you will likely find yourself going back and forth between your options. One moment you may think that adoption is the best alternative; the next moment you may decide that parenting is. It’s normal. Placing a baby for adoption is a process that doesn’t follow a simple, straight line. Contrary to myth, expectant parents don’t choose it out of a lack of love for their child. They choose it precisely because they love their child so much they want them to have the best. And that’s what makes the decision so hard. Your heart may say one thing, but your head says another. If you feel like you’re struggling with getting your life together and you’re not ready to take on the responsibilities of taking on another one, open adoption can be an appealing alternative. Just keep in mind that it’s a permanent decision, and it’s not co-parenting. At no time in the decision-making process should you feel like you’re being forced into making a choice that you’re not 100 percent comfortable with. It needs to be your choice. Think about you want. More importantly think about what your child needs. Because at the end of the day, that’s what adoption is all about — doing what’s right for your child. Have I explored all of my options? In an unplanned pregnancy, you essentially have three options: parenting, abortion, adoption. Each choice is difficult. Still, it’s important to consider each one carefully and to take the time to explore the pros and cons before making a final decision. Every expectant mother will go through this process in their own way, at their own pace. Eventually they’ll come to a decision based on a process of elimination. There is no cookie-cutter, one-size-fits-all solution. What might be right for others may not be right for you. Educate yourself by reading up on all of your options. Speak to people who have been in your shoes. Be flexible, keep an open mind, and be prepared to change it if you need to. As you go through your choices, you may decide that abortion is against your personal or religious beliefs. You may also decide that as much as you would love to be a parent, you’re not financially or emotionally ready to do so. Don’t leave it there. Go deeper. For instance, if you decide you want to parent there’s nothing shameful about seeking help. There may be family members or government programs you can tap into that can assist you. 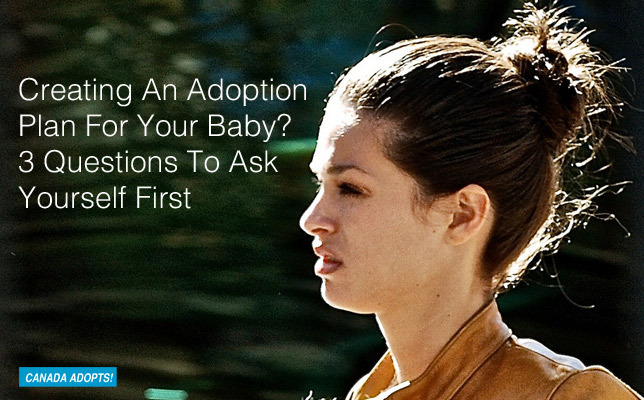 If you end up choosing adoption, be prepared for a rough ride. People will accuse you of everything from taking the easy way out to not loving your child. They’ll share horror stories and fill your head with tales they’ve heard where the adoptive parents promised an expectant mother the world and then closed down the adoption the first chance they got after placement. Those stories do happen. A lot depends on the individuals involved, their expectations, their integrity, and their communication skills. As in any relationship, there are no guarantees. But there are also just as many, if not more, stories of parents who have placed their baby for adoption and gone on to build a loving, lifelong relationship with their child and the adoptive family. When you’re faced with an unplanned pregnancy, it’s easy to feel alone, like you’re the only person in the world who’s ever been in this situation. But other people have gone down this road before and in many cases are stronger today because of it. No matter what decision you make, there are professionals you can turn to for support and guidance. A counsellor can walk you through the process from start to finish, explain what you need to do at every stage, and help you navigate all of the ups and downs. She can also put you in touch with other women who have created an adoption plan. By listening to their stories, you can get a better idea about what’s involved in the process and how to deal with it emotionally and physically — not only now, but also at placement, and beyond. Creating an adoption plan isn’t easy. The key is to soak up everything you can ahead of time so that when the time comes to make a decision you can make an informed choice and choose the path that’s best for you and your child.